I want to retch when I read Arne Duncan is going somewhere to pay tribute to MLK. In fact, King was assasinated while in Memphis, supporting striking workers. Duncan, conversely, is in the pocket of billionaires like Bill Gates and Eli Broad, tinkering with ineffectual pipe dreams that target working people and do nothing whatsoever to help the kids it's, ostensibly at least, his job to represent. Four years ago, I voted for Barack Obama, hope and change. Yet, for the most part, all I see is the same corporate-friendly nonsense we saw for eight years under GW Bush. In Obama's defense, yes, he at least seemed to have gotten more votes than his opponent. And when I looked at John McCain's proposals for education, it seemed imperative to oppose him. Yet now, four years later, there seems little in educational policy that differs between McCain and Obama. Bill Clinton had a Sister Souljah moment that he used to his political advantage. Obama has nothing whatsoever to say about that, because he's made teachers his Sister Souljah. When accused of being too liberal, he'll assert that he's all for screwing the teachers, so he's independent after all. But Obama, in fact, is not only screwing teachers. By lending legitimacy to the nonsense spouted by billionaire-backed "reformers," he's attacking what is likely one of the last bastions of vibrant unionism in this country. This, in fact, is why Gates, Broad, and the Walmart family support this nonsense. What is being done to address the very real problems that lead to kids failing in school? Nothing. That's complicated. Far easier to blame unionized teachers and compare all-inclusive public schools to preposterously selective charters. Amazingly, with all their advantages, charters tend not to out-perform public schools. Nonetheless, all that money gets them films like Waiting for Superman, glorifying folks like Geoffrey Canada, who dismissed an entire cohort to juke his stats. Can you imagine what public schools could do, given such options? Of course, that would mean emulating the "ethics-shmethics" approach of the corporate "reformers." How dare the corporate union-busters invoke MLK in their nonsensical and cynical attempts to bust union under the shallow pretense of helping children? Even now, uber-"reformer" Mike Bloomberg is suggesting it's a good idea to shed 33 schools of half their teachers. This would inevitably toss these schools into abject chaos, and Bloomberg doesn't give a golly goshdarn one way or the other. Because the kids, in fact, are the least of his concerns. He and his buds prefer to sent their kids to elite private schools with the small class sizes he denies public schools (despite taking hundreds of millions of dollars to create them). And now Bloomberg, who thwarted voters to buy a third term, so as to work his financial genus on NYC, wants to spend 350 million, at least partially to save 60 million in federal funds. Makes sense to him. But MLK would never support these corporate "reformers." MLK would stand with working people. And MLK would know these children the corporatists purport to put "first" will grow up to be working people. In fact, teaching is a path to the middle class for kids like those I teach. Worsening working conditions for teachers not only hurts working people, but also narrows the options for these kids. 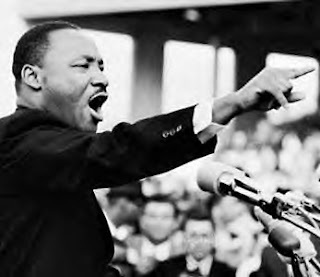 On this day, we should celebrate the legacy of Martin Luther King Jr., and be absolutely confident that he would stand with us in our struggle against the cynical, ruthless billionaires who would gleefully reduce us to the status of McDonald's fry cooks or Walmart "associates." Shame on those who sully his memory by associating their self-serving agendas with him.